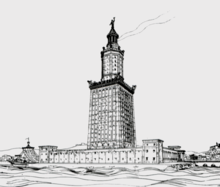 The Lichthoose o Alexandria, sometimes cried the Pharos o Alexandria (Auncient Greek: ὁ Φάρος τῆς Ἀλεξανδρείας), wis a lichthoose biggit bi the Ptolemaic Kinrick atween 280 an 247 BC which was atween 393 an 450 ft (120 an 137 m) taw. Ane o the Seiven Wunners o the Auncient Warld, it wis ane o the tawest man-made structurs in the warld for mony centuries. Badly damaged bi three yirdquauks atween AD 956 an 1323, it then acame an abandoned ruin. This page wis last eeditit on 5 Mairch 2018, at 06:52.